(Phys.org)—Preliminary weather reports from the Curiosity's Remote Environment Monitoring Station (REMS) are showing some surprisingly mild temperatures during the day. Average daytime air temperatures have reached a peak of 6 degrees Celsius at 2pm local time. A Martian day – known as a Sol – is slightly longer than Earths at 24 hours and 39 minutes. Temperatures have risen above freezing during the day for more than half of the Martian Sols since REMS started recording data. Because Mars's atmosphere is much thinner than Earth's and its surface much drier, the effects of solar heating are much more pronounced. At night the air temperatures sink drastically, reaching a minimum of -70 degrees just before dawn. NASA's Mars Science Laboratory touched down in Gale Crater on 5th August 2012 close to the equator of Mars at a latitude of 4.5 degrees south. The southern hemisphere of Mars is approaching springtime, leading to speculation about possible temperatures for at the height of Martian summer. "That we are seeing temperatures this warm already during the day is a surprise and very interesting," says Dr Felipe Gómez of the Centro de Astrobiología in Madrid. "It's very early days and we are only now being able to test our models against REMS observations. If this warm trend carries on into summer, we might even be able to foresee temperatures in the 20s – and that would be really exciting from a habitability point of view. In the daytimes, we could see temperatures high enough for liquid water on a regular basis. But it's too soon to tell whether that will happen or whether these warm temperatures are just a blip." 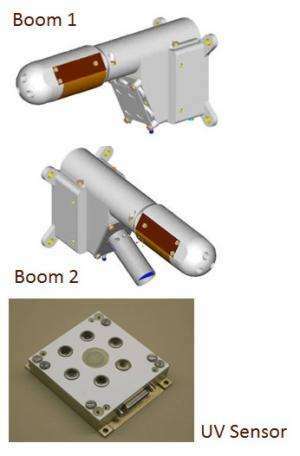 Two small booms on the rover mast will record the horizontal and vertical components of wind speed to characterize air flow near the Martian surface from breezes, dust devils, and dust storms. 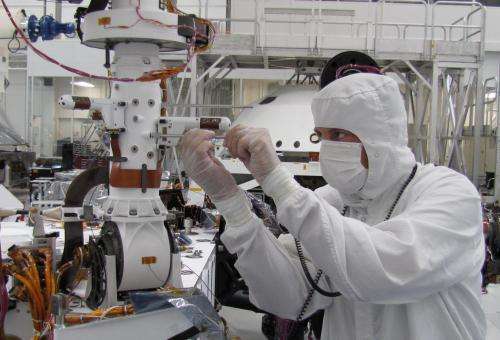 A sensor inside the rover's electronic box will be exposed to the atmosphere through a small opening and will measure changes in pressure caused by different meteorological events such as dust devils, atmospheric tides, and cold and warm fronts. A small filter will shield the sensor against dust contamination. Credit: REMS Team/CAB. "The pressure data show a very significant daily variation of pressure, following a fairly consistent cycle from Sol-to-Sol. The minimum is near 685 pascals and the maximum near 780 pascals. The majority of the variation is due to large scale waves in the atmosphere called tides. These tides are different from tides in the Earth's ocean because they are forced by heating due to the sun rather than the gravitational pull of the Moon. The tides are sensitive to the distribution of cloud and dust in the atmosphere, and also the large scale pattern of winds – rather like the jet streams on Earth," says Javier Gómez-Elvira, the Principal Investigator of the REMS Instrument.